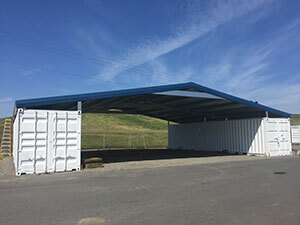 Podroof’s new shipping container roof kits are made of American steel components and come with a 20-year guarantee. Podroof kits have standard ratings of 70 miles per hour for wind and 25 pounds per square foot for snow load with higher ratings available. Podroofs are designed for quick and easy construction and the kits can easily be disassembled, transported and re-assembled as needed, the company said. The Podroof kits are 20 feet long and attach to two shipping containers with custom brackets. Gable and gambrel roof types are offered and available in standard and custom spans. Various options are available including painting, fencing and gutters. Podroof offers free delivery within the continental United States.